This is a historic period. Despite the misunderstanding over a ‘ceasfire’ in the Turkish media and public, the PKK’s jailed leader Ocalan in fact did ask the guerillas to move out of Turkey on March 21, as Kurds celebrated the beginning of the spring, Newroz. His speech’s motto was that it is time for “politics” rather than “armed struggle”. His promising call, read both in Kurdish and Turkish, was slightly puzzling. But three overall points stand out; a call harmony, a rather selective critique of the Kemalist nation state and a request for forgiveness. Ocalan’s reference to the coexistence between various ethnic and religious communities in Mesopotamia, his emphasis on the brotherhood between the Euphrates and the Tigris and Sakarya and Meric, and his mention of Near Eastern cultures is the symbolic construction that paves the way for an approaching peace between Kurdish and Turkish people. These exciting pldges are flavoured with Islamic references, which seem to constitute a fundamental pillar of Ocalan’s upbeat language. Yet, they must be taken with a pinch of salt after the destruction of the last eighty years. Once an ardent secular Marxist, Ocalan does not reveal how he reconciled himself with Islam. It is true that many Kurdish people are devout and would support Islam becoming a cement for the Kurdish and Turkish people, but it remains unclear how the secular Kurds and the PKK will make their peace with Islam. If Islam is the common ground, what political moves will be taken to reconcile the relationships between ethnic identities? Ocalan’s critique of the Kemalist state gives some important clues as to the so-called new nation-building process. Clearly, he rejects those practices of the old state structures which encourage assimilation. It seems he is willing to reconcile himself with a democratic Turkish state that recognizes various “national identities.” The question is, however, if such an environment will actually allow Kurds, Armenians, Alevis and others to relate to their own cultures? Also, we do not really know if Ocalan’s claim to be forging a new modern democratic state means that he supports a liberal democratic state. The liberal democrat Turkish state will not come out of nowhere and it is likely to take at least a decade. Moreover, every community might have its hopes and expectations, but at the same time they have many drawbacks. This is most obvious among the Turkish people because the definition of their identity might change, leaving many Turks in agony. That’s why there is a remarkable rise of banal and campaigning Turkish nationalism. A tension between competing national identities might challenge Ocalan’s rhetoric and the new democratic state. 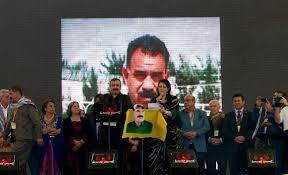 Forgiveness is Ocalan’s key word when he looks at the disarmament, demobilization and reintegration (DDR) process. Although he attempted to encourage Kurdish and Turkish people to forgive each other, it is unlikely that such a process will work smoothly. The Turkish government has consistently rejected the idea that ex-guerillas will be given amnesty and dismissed the idea to create a legal process for it. This is the weakest point of the ongoing peace negotiations because although everybody talks about the DDR process, it seems all key actors are refraining from discussing a truth and reconciliation process and forgiveness. How will we forgive each other if our wounds are not addressed? Would the Kurdish and Turkish mothers forgive the Turkish security forces and the PKK that killed their each other’s beloved ones? Overall, despite some important problems in Ocalan’s letter, it is promising and opens a new historical era in the history of the Middle East. Yet, it needs to be deconstructed if we want this peace process to succeed. The peace process has been functioning on mutual and symbolic bona fides that are actually not very strong. What is missing in this process is simply the people. It is a mistake that has been made many times over the course of last ten years, and, we, the people of Turkey, should be actively involved in this peace process. We cannot remain indifferent to Newroz, to the brotherhood of people and to the Mesopotamian peace. P.S. I wholeheartedly support this peace process. Yet, one needs to acknowledge the weaknesses of the process and address them in order to succeed. The Turkish media’s unjustified attack on Bejan Matur, a Kurdish poet who succinctly showed how fragile the peace process is, is not a contribution to peace. Rather it is a misunderstanding of the peace process. I salute you Bejan and want you to know that I am in solidarity with you.